The day began, of course, with a hierarchical Divine Liturgy led by the Father and Head of the Ukrainian Catholic Church, His Beatitude SVIATOSLAV and all the Bishops of the Ukrainian Catholic Church. Among the special guests were the Head of the Melkite Catholic Church, His Beatitude GREGORY III, as well as the representative of Pope FRANCIS, the Papal Nuncio to Ukraine, Archbishop CLAUDIO Gugerotti. On the evening of the first day, praying a Moleben’ to the Holy Spirit, the Bishops invoked the presence and guidance of the Holy Spirit throughout the week-long Synod. They also made an oath about maintaining the confidentiality of the proceedings and of their personal dedication to participating fully in the deliberations and decision-making. NOTE: The miraculous Icon of the Theotokos “The Door of Mercy”, that gained world fame when Pope Francis chose it as the icon to be venerated in Rome at the December 8, 2015 opening of the Extraordinary Jubilee Year of Mercy, was brought to Lviv to be exposed for prayer and veneration for the duration of the Synod of Bishops – 4-11 September 2016. 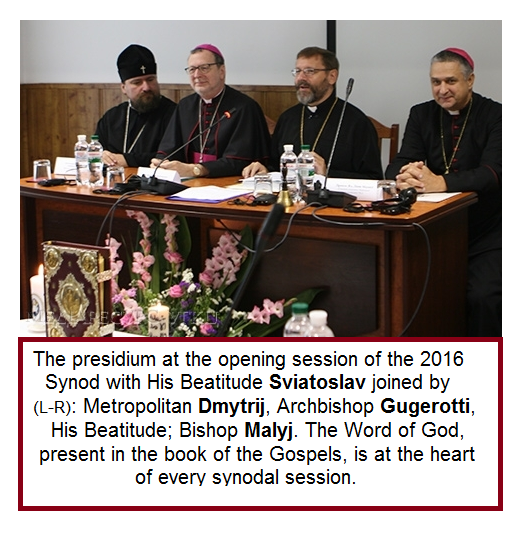 His Beatitude Sviatoslav asks all the Faithful of the Christ’s Church to pray for the success of this week’s Synod. On Saturday, 10 September, the Icon will be processed to the new Chapel of “Holy Sophia” at the main campus of the Ukrainian Catholic University, also in the city of Lviv. Here an all-night vigil of liturgical services, prayer and song will continue into the following day. On Sunday, 11 September, the Bishops, having completed their Synod, will come to the University for the consecration and official dedication of the recently completed cathedral-size chapel. At the opening session, a number of special guests and observers were welcomed and also brought greetings on behalf of their Churches. His Grace, the Papal Nuncio to Ukraine, Archbishop CLAUDIO Gugerotti brought a blessing and greetings from His Holiness, Pope FRANCIS; Among them were the Ukrainian Orthodox Metropolitan of Lviv within the jurisdiction of the Kyivan Patriarchate, His Eminence DMYTRIY; bringing greetings from the Roman Catholic Church was Auxiliary Bishop of Lviv, His Excellency LEON Malyj; on behalf of the Ukrainian Orthodox Church associated with the Patriarch of Moscow greetings were read by Archimandrite MARKIAN (Kayumov); Archpriest BASIL Hovera, the Apostolic Visitor for Easter Catholics in Kazakhstan, brought greetings from the Kazakhstan Conference of Catholic Bishops; Archimadrite SERGIUS Gayek, the Apostolic Visitor for Eastern Catholics in Belarus also read greetings. Stay updated by visiting the UGCC website and continue to pray. Ektenia petition... „Ще молимось за успіх Патріаршого Синоду нашої Церкви, щоб поклонялись ми завжди в дусі і правді і оспівували Пресвяту Єдиносущну Тройцю в єдності, Господи молимось Тобі, вислухай і помилуй!”.